Ultra-luxury skincare company Apeiro introduces trio of brand new Ultra Diamond Collection products. NEW YORK, NEW YORK, UNITED STATES, April 1, 2019 /EINPresswire.com/ — Unveiled earlier this year, ultra-luxury skincare brand Apeiro's latest collection boasts what the company calls one of the most potent ingredients in the beauty world – pure diamond powder. Comprised of the Ultra Diamond Lifting Mask, Ultra Diamond Lifting Serum, and Ultra Diamond Lifting Cream, Apeiro's all-new assortment of Ultra Diamond Collection products is tailored to plump and rejuvenate the skin, and to further defy the effects of aging, according to the brand. "As the name suggests, our ultra-luxurious Ultra Diamond Collection mask, serum, and lifting cream are all infused with pure diamond powder," reveals Apeiro's vice president of operations, Eric Inbar. Known, he says, as one of the most potent ingredients in the world, pure diamond powder is a perfect means of gentle exfoliation capable of uncovering radiant looking skin and a more youthful appearance. "Accordingly, each of our Ultra Diamond Collection masks, serums, and lifting creams is painstakingly formulated to leave skin feeling supple, lifted, and hydrated," adds Inbar. Suitable for all skin types, Apeiro's Ultra Diamond Lifting Mask incorporates both pure diamond powder and further exclusive specialty age-defying ingredients intended to assist the skin in achieving a plumper and more lifted look, according to the ultra-luxury skincare company. Its equally special Lifting Serum, meanwhile, is touted to instantly lift and rejuvenate the appearance of the skin, again infused with pure diamond powder. Lastly, the collection's third addition—its Ultra Diamond Lifting Cream—is said to offer unique age-defying properties. "Our Lifting Cream is a truly rich cream which perfectly melts into the skin to deliver a beautifully lifted appearance," explains Inbar. 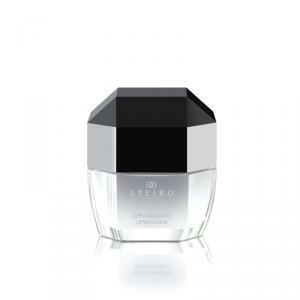 Much like the Lifting Mask, both Apeiro's Ultra Diamond Lifting Serum and Ultra Diamond Lifting Cream are, too, he says, suitable for all skin types. One of a number of exclusive, ultra-luxurious collections offered by Apeiro, the Ultra Diamond Collection joins the brand's Royal Scepter and Collagen collections, plus a further selection of body, cleansing, and eye-focused ranges. Apeiro's Collagen Collection currently includes its Collagen Radiance Renewal Treatment Mask, Collagen Radiance Renewal Treatment Serum, Collagen Radiance Renewal Treatment Cream, and its 12-in-1 Collagen Treatment Mask, all of which are exclusive to the brand. The Royal Scepter Collection, in parallel, includes Apeiro's exclusive Royal Scepter Thermal Mask, Royal Scepter Serum, Royal Scepter Cream, and Royal Scepter Silk – a lavish gel-cream expertly formulated from potent, organic minerals combined with natural, botanical extracts to afford what the brand calls 'a radiant and divine visage,' achievable from the first application. To find out more about Apeiro's Ultra Diamond Collection, its Collagen Collection, the Royal Scepter Collection, or any of the brand's other ultra-luxury, all-exclusive skincare products, please head to https://www.infinitebeautyusa.com/.